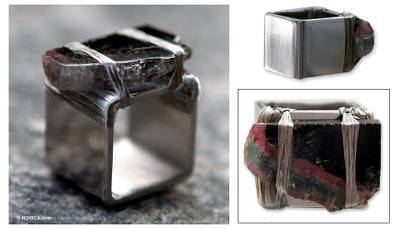 Square Stainless Steel Ring with Tourmaline, "Tantalizing"
Brazilian designer Cathrine Clarke transforms stainless steel into a symbol of time and space for her Prêt-à-Porter collection. She designs a square ring that exudes modern elegance, while threads of stainless steel evoke continuous movement. Tourmaline provides a tantalizing accent as it conveys the power of nature with its three distinct colors. "By choosing jewelry, painting and literature as a medium of expression, I understand that art is a means, not an end, in my continual search for a genuinely more creative and rewarding way of life." Catherine Clarke was born in São Paulo, and graduated in Humanities. She then studied goldsmith, Jewelry Design and Gemology. Today, she devotes her time to the theories of art as a base for her contemporary designs. Catherine has received Brazilian and international renown through many awards, including the 2001 Pearl Design Contest sponsored by the Japanese government, and the Swiss Europa Star's "2002 Achievements in Inventiveness." The designer was invited by the Foreign Ministry in 2001 to participate with her conceptual jewelry in a governmental program to promote Brazil and its design in other countries. The following year, she was nominated as one of the best Designers of Today, by the editors of Couture International Jeweler magazine. Catherine has held exhibitions in South America, Europe, Japan, and the United States. She recently partook in the 1st Brazilian Design Biennial, and in the Gemological Institute of America's (GIA) exhibit of their Brazilian Designers collection, which she helped curate by suggesting candidates. Nowadays her jewelry is displayed in art galleries throughout Brazil as well as in New York and in Harrogate (England). Her latest collection, Prêt-à-Porter, includes round, square and triangular bracelets and rings cast in stainless steel. They symbolize space and time, and feature rough gems and diamonds wrapped in gold or stainless steel wires, which remit to the artistic production and provides each piece with its own identity. "To me, the purpose of creating a piece of jewelry is to make what is visible, invisible, and what is invisible, visible," confides the designer. Just as in nature, where nothing repeats itself, Catherine enhances the innate characteristics of Brazilian gems on one-of-a-kind designs that are multifunctional featuring kinetic effects. "Instead of cutting gems to befit projects, I prefer to invert the process: I abstract from natural formations based on techniques and theories of Contemporary Art. By choosing jewelry, painting and literature as a medium of expression, I understand that art is a means, not an end, in my continual search for a genuinely more creative and rewarding way of life." Catherine's work has received praise and admiration in different publications, including Claude Mazloum's book Jewelry Designers of the 21st. Century and Joice Joppert's A Glimpse of Brazilian Design, as well as in international magazines such as Nexos, (Mexico); Arte y Joya (Barcelona); Collection (Beirut); GZ Design + Art and GZ Design + Art's Flyer (Stuttgart); J.Q. Magazine (Sonoma); L'Orafo (Milan); Loupe (GIA); The Basel Magazine (London); Words and Pictures (Kirkland). Catherine also lectures and writes articles, critiques and biographies on jewelry and designers for two important art magazines in Brazil.